Upholstery cleaning is an expensive job to be done. The prices may be excessive for your budget. But not if you use our company. 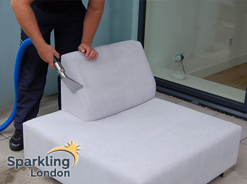 We offer upholstery cleaning of high-quality and at affordable prices. We currently run errands in several areas of London. Our company is a reputable one, it is certified and insured. We have wonderful crews of experienced cleaners who work very eagerly and devotedly. We offer a variety of cleaning packages that will suit your taste and criteria. There are many myths when it comes to the frequency of cleaning upholstered furniture. It generally depends on several factors. For example, do you use your couch or sofa regularly? Do your tend to have a snack there? Do you have pets; do they lie on the furniture? How well do you maintain your upholstery if you do? As a whole, you should get your furniture cleaned at least once a year, which will not only remove all pollutants and germs, but it will also prolong its life. Cleaning your belongings by yourself requires special skills, which is why we do not recommend this practice. There are items that have to be cleaned with water-based cleaners and others that require dry cleaning methods. ou should leave it to us. Our cleaners have the knowledge and skills necessary for this type of job. They know how to use our steam cleaning machines effectively. Once they finish the job, your furniture will be renewed. Remember, we help keep your items fresh and clean for many years. If you call you, will not regret it. Trust us. We have the solution for your cleaning situation. You only have to make us in charge of the task. We promise to treat your furniture without harming the delicate fabric. You will see if for yourself sooner or later. We can save you money, time and worries. Get in touch with is now.